Since February Is Heart Health Month, We Will Take The... – Juka's Organic Co. Since February Is Heart Health Month, We Will Take The Opportunity To Share Few Things We Know About Heart Health. 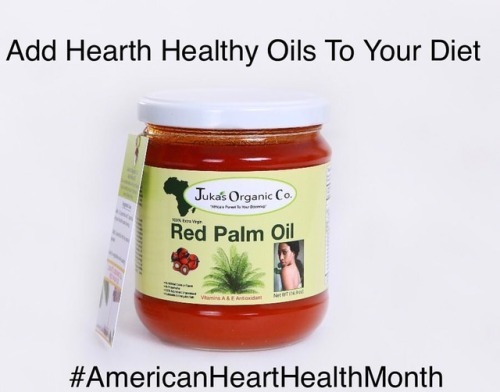 Stay heart healthy & add heart healthy food oils to your diet such as, healthy cooking oils; Unrefined Red Pam Oil, Cold Pressed Coconut Oil, Peanut Oil & Extra Virgin Olive Oil. Eat more heart healthy foods like avocado 🥑 , nuts 🥜 salmon & berries . Use spices to season your food and less salt. Reduce stress in your life and exercise regular not just to look good but to save yourself from cardiovascular diseases. Let’s talk Red Palm Oil & Coconut Oil quickly. Whether their has been scientific studies to back a lot of information about healthy oils available to us or not, it is most important to see how your body reacts with certain foods. For many years, there have been controversies about which oils are best for us. But fact is when you personally use unrefined red palm oil or Coconut oil and you watch your cholesterol level regulates, you start to feel better, breath better and have more energy then it really won’t matter what studies tell you on paper. You will naturally turn to these special oils as healing oils. The thing with red palm oil is, our Aftican ancestors have always used it as a healing cooking oil. But somewhere down the line, they were told red palm oil wasn’t good for them so the younger generation starting drifting away from consuming it as they did with many other natural food products. But it is refreshing to now see everyone going back to it with new studies proofing otherwise. So this is why we say, we cannot only rely on what studies are telling us but what our bodies tell us instead. Take charge of your health. Turn to natural foods and oils that was here before science and medicine experience a healthy lifestyle.